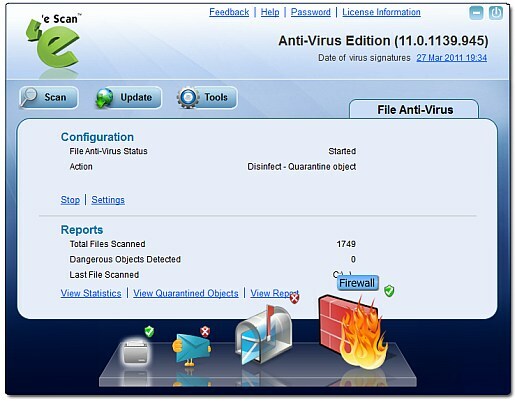 eScan has just released an updated version of their flagship antivirus software. The biggest change is a revamped interface that has significantly improved over the previous version and provides an OSX like dock to navigate through the application. In addition to being more visually pleasing, the software offers excellent protection via the 6,999,003 virus and malware signatures (some of the most seen in a consumer antivirus). eScan 11 has also been certified by all major testing labs including ICSA, WestCoast, AV-comparatives, and OESIS. In addition to the main antivirus engine, there is an included firewall, antispam, recovery disk and more. 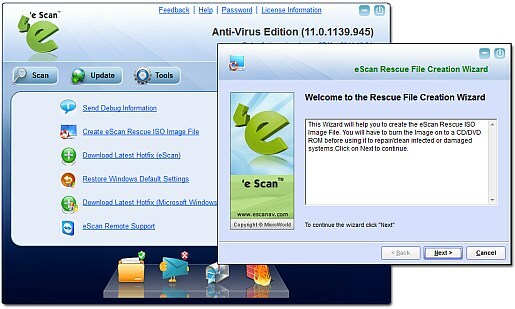 The installation of eScan 11 was good and designed for Windows 7. The download size is 157 megabytes which is actually on par with the average internet security program. The installer automatically disabled Windows Defender and Firewall and ran an initial virus scan to check for viruses (can take a while so, one may want to skip). One problem was that once the setup completed, the program wanted to play an introductory video. There are a few bugs as it didn’t go to a completely full screen. One is also given the option to restart the computer, which is necessary to start the firewall. One of the biggest updates in version 11 is a white list or memory scanning technology. This technology utilized by Norton and others, speeds up scans by ignoring files that may not have been modified and are known as safe (subsequent scans really do increase in speed). There are 5 scanning options which include, computer, USB, critical area (memory, registry, and services), and custom scans. The virus scanner is faster than average at 6 to 7 megabytes per second. I ran into one problem that needs to be fixed. I accidently clicked on the scan button twice (took a while to initially load) which launched two independent scanners. There needs to be some safeguard to prevent this from happening. The scanner detected one virus on the test system BLuPro as a Trojan.Generic.4842150 (DB). This is a false positive as it is associated with Bkav antivirus. Escan 11 also detected Malware.Win32 (ES). One thing that I like about the scan was the option to instantly set the scanner to low priority (even though the scan didn't significantly affect system operation). I didn’t like that there wasn’t a time till completion or even a status bar for the scan. Also when a scan is finished, it’s not really apparent to the user except for a small “Scan Completed” in the lower status bar. 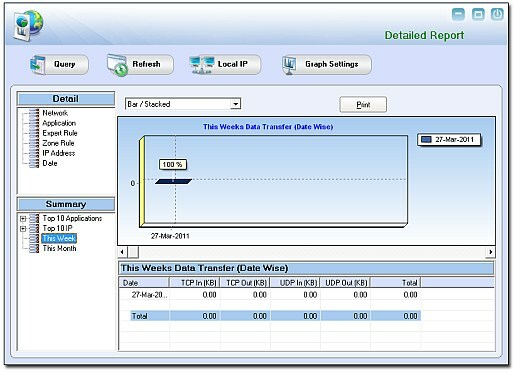 The real time scanner can be customized to a certain extension, code analyzer, maximum file size, and the option to scan network drives. The real time shield can also block USB drive executable and can protect specific user defined files from modification. The update interval is set as 120 minutes (can be set as low as 30) by default and can even execute a program after an update (better than most free antivirus). 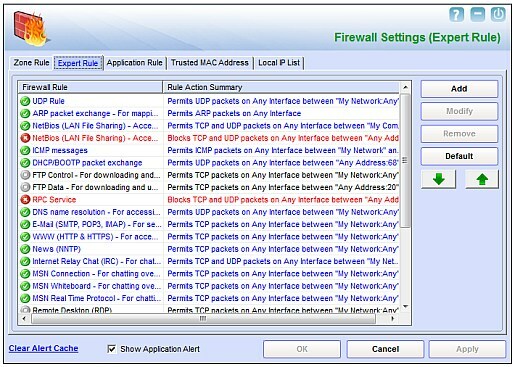 The firewall offers four settings the allow all, limited filter (default via pre defined rules), interactive filter (prompts for every application), and block all. With the limited filter enabled I didn’t encounter any prompts to allow connections. In the settings area, eScan 11 correctly auto detected the local network IP address range and added it as trusted. The Expert Rule area has rules for all major ports and protocols including http, dns, msn, rdp, and more. If one is unhappy with a rule, it can be easily customized via a specific interface (new) and a large list of source and destination options (my computer, network, single or range of IP’s, port, port range or list etc.). I think the most unique thing is the reporting functionality which can show most network activity for a month or even longer with the top 10 IP's and applications and when a rule was revoked. I am a little annoyed that the eScan 11 doesn’t include their own network activity monitor (they just used ViewTCP 3.1). eScan 11 also includes an option to create a Rescue ISO disk, restore default settings to window, and an option to download the latest hot fixes for the program. The mail scanner has several customization options and functions via port rather than the application level (therefore, is compatible with all email clients). However, I like the Anti-Spam in that it reports to major antispam servers. There is also a virtual keyboard and gaming mode option accessible via the tray icon. eScan 11 has efficient resource usage. The program uses about 30 megabytes of RAM while idle and about 70 megabytes while scanning. CPU usage can range from 5 to 12 percent CPU power. It seems that the scanner is automatically put into a lower priority if it is detected as running in the background.